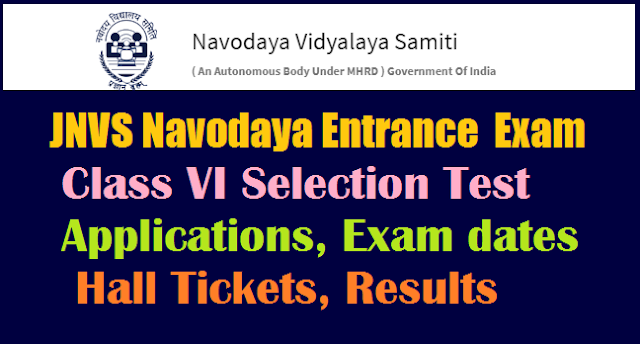 Navodaya Entrance Exam 2018 : Navodaya Vidyalaya Samiti, Ministry of Human Resource Development, Department of School Education and Literacy Officials would sent the "Time Activity Schedule for Conduct of JNV Selection Test 2018 for Class VI" to all the Deputy Commissioners of NVS Regional Offices and All the Principals of Jawahar Navodaya Vidyalayas. In this connection officials are requested to follow the Time Activity Schedule for conduct of JNV Selection Test 2018 for admission of students to Class VI in Navodaya Vidyalayas for the academic year 2018-2019. In this regarding Officials has also sent to Prospectus and Application Form for conduct of JNV Selection Test 2018 for Class VI. Co-educational residential schools in every district Separate hostels for boys and girls Free education, Board and Lodging Wide cultural exchange through Migration Scheme. Computer: Pupil ratio - 1: 8 Best results in classes X & XII 1176 & 11875 students qualified in JEE (Advanced)-2017 and NEET- 2017 respectively. 0 International admission for 4 students from unprivileged class after class-XII in 2017-18 . Atleast 75% seats for children from schools located in rural areas. 1/3rdseats for girls. 3% seats for Divyang children. Seats for Scheduled Caste & Scheduled Tribe as per Govt. of India norms. How to register Online for J NV Selection Test 2018? (ii) The eligible candidates along with his /her parent/guardians may approach "Common Service Centre" along with duly filled in cer tificate from the Head Master of School wher e the candidate is studying in Class V. The for mat of cer tificate may be downloaded fr om Samiti website www.nvshq.or g The sample of for mat is enclosed. 2.6 lac centres across the country virtually covering every village. As per the MOU with NVS, Common Service Centre will be charging Rs 35/¬(Rupees thirty five only)towards service charge to upload the application form per candidate. Navodaya Vidyalaya Samiti has made a change in this year's application. Applicants can apply online till November 25. An entrance test will be held on February 10 next year. "Common Service Centers (Aadhaar Cards, PAN Cards)" can be applied online directly. Certificate to be produced at the Common Service Center for JNVST 2018 Registration. The cost per each student is Rs. 35 for Online application form sumbission. The next, hall ticket can be downloaded at 10 rupees there. The application is placed on the website. Fill it and carry it with the corresponding school headmaster. Certified that the information given below are correct in respect of (Name of Student) who is studying in Class V in (Name of School) and interested to apply for Jawahar Navodaya Vidyalaya Selection Test 2018. For downloading the admit card, Common Service Centre will be charging Rs.10/-per candidate, which is to be paid by the parent/candidate. 1. Selection in the test will not vest any right on the candidates to secure admission into the JNV. At the time of seeking actual admission, each selected candidate will have to produce all relevant certificates, as prescribed by the Navodaya Vidyalaya Samiti. Until admission, the selection is provisional. 2. In case of any dispute, the decision of Navodaya Vidyalaya Samiti shall be final and binding on the candidates. 3. Marks obtained by candidates (both selected and unselected) in the test are not communicated. 4. It may also be noted by the candidates and their parents/guardians that under the scheme of JNVs, students of a JNV located in Hindi speaking State may have to be migrated to another JNV in Non-Hindi Speaking State and vice-versa for one academic year when the students are promoted to Class IX. In case of refusal from the students selected for migration, continuation of such students in JNV will not be allowed. 5. The candidates and their parents/guardians may note that the children selected on the basis of the Test will be admitted only in the JNV located in the district from where they are appearing at the JNVST. Under no circumstances, the selected candidate will be given admission to any other JNV. No request for shifting of students on account of medium of instruction in the JNV concerned, shifting of parents/guardians to other district(s) State(s) etc. will be entertained. 6. Candidates belonging to the Scheduled Castes (SCs) and Scheduled Tribes (STs) will have to produce a certificate of the Caste/Tribe at the time of seeking admission, if selected. Such certificate should be procured from the competent authority before ...., of the year of seeking admission so that it may be submitted to the Principal of concerned JNV at the time of admission. 7. Candidates belonging to the disabled category (Orthopedically Handicapped, Hearing Impaired and Visually Handicapped) if selected will have to produce a medical certificate signed by Chief Medical Officer of the District concerned at the time of admission. 8. Candidates belonging to the disabled category (Orthopedically Handicapped, Hearing Impaired and Visually Handicapped) can seek admission in the district in which they are studying in Class V on regular basis at the time of applying for JNVST or their native district where his/her parents are residing. 1. Only the candidates from the district concerned where the Jawahar Navodaya Vidyalaya has been opened are eligible to apply for admission. However, the district where JNV is opened and is bifurcated at a later date, the old boundaries of the district are considered for the purpose of eligibility for admission into JNVST, in case a new Vidyalaya has not started in newly bifurcated district as yet. 2. A candidate seeking admission must not have been born before 01-05-2005 and after 30-04-2009. This will apply to candidates of all categories, including those who belong to the Scheduled Castes (SCs) and Scheduled Tribes (STs). In case of doubt of overage candidate seeking admission, they may be referred to the Medical Board for confirmation of the age. The decision of the Medical Board will be final. 3. A candidate appearing for the selection test must be studying in Class-V for the whole of the academic session 2018-2019 in a Government/Government aided or other recognized schools or ‘B’ certificate competency course of National Institute of Open Schooling in the same district where he/she is seeking admission. A school will be deemed recognized if it is declared so by the Government or by any other agency authorized on behalf of Government. The Schools receiving financial assistance under Sarva Shiksha Abhiyan should be sponsored by Govt. or Govt. authorized agencies. Schools where students have obtained ‘B’ certificate under National Institute of Open Schooling should have accreditation of NIOS. A candidate must successfully complete Class-V in the session 2016-17. Actual admission in Class-VI for the session 2018-19 will be subject to this condition. 4. A Candidate claiming admission under rural quota must have studied and passed classes III, IV and V from a Govt. / Govt. aided / recognized school spending one full academic session each year in a school located in rural area. 5. Candidates who will be passing ‘B’ certificate competency course of National Institute of Open Schooling on or before 30th September are also eligible to write admission test provided they are in the prescribed age group. The forms of such candidates will be verified by DEO/DIOS. The rural status of a child from National Institute of Open Schooling will be decided on the basis of a certificate to be issued by Tehsildar/District Magistrate of the District indicating that the child has been residing in rural areas for the last three years. Students studying under the above scheme from urban and notified areas are not eligible for obtaining seat in rural quota. 6. A Candidate who has not been promoted and admitted to Class-V before 30th September, is not eligible to apply. 7. No candidate is eligible to appear in the selection test second time, under any circumstances. 1. Affidavit/Residence Certificate in prescribed Performa in addition to other documents demanded by the concerned Vidyalaya. 2. For candidates seeking admission under rural quota, the parents will also have to submit an affidavit to the effect that the child is studying in an Institute located in a notified rural area and that they are residing in a notified rural area. 1. At least 75% of the seats in a district will be filled by candidates selected from rural areas and remaining seats will be filled from the urban areas of the district. 2. A candidate seeking admission under the rural quota must have studied in Classes-III, IV and V completing full academic session from the recognized school(s) located in rural areas. 3. Candidates studying under the National Institute of Open Schooling should produce their rural status certificate issued by District Magistrate/ Tehsildar/Block Development Officer. JNV Selection Test for admission to Class-VI in JNVs for the academic session 2018-2019 will be held as per following schedule. The last date for submission of Application Form in BEO’s Office is 25-11-2017. A. On Saturday, the 10th Febraury, 2018 at 11.30 A.M. in the State of Andhra Pradesh, Telangana, Assam, Bihar, West Bengal (except Darjeelin0g) Chhattisgarh, Goa, Gujarat, Haryana, Himachal Pradesh (except Chamba, Kinnaur, Mandi, Sirmour, Kullu, Lahaul & Spiti and Shimla Districts), Jharkhand, Kerala, Karnataka, Madhya Pradesh, Maharashtra, Manipur, Orissa, Punjab, Rajasthan, Tripura, Telangana, Uttar Pradesh, Uttarakhand, Delhi, Arunachal Pradesh (except Tawang District), Union Territories of Andaman & Nicobar Islands, Chandigarh, Dadar & Nagar Haveli, Daman & Diu, Lakshadweep and Pondicherry . B. On Saturday, the 8th April, 2018 at 11.30 A.M. in the States of Meghalaya, Mizoram, Nagaland, Sikkim ,Jammu and Kashmir (except Leh & Kargil) and in the District of Tawang of Arunachal Pradesh, in the Districts of Chamba, Sirmour, Kullu, Kinnaur, Mandi, Shimla of Himachal Pradesh, in the District of Darjeeling of West Bengal. C. On Saturday, the 9th June, 2018 at 11.30 A.M. in the Districts of Leh, Kargil of J&K State and in the District of Lahaul & Spiti of Himachal Pradesh State. 2.Four fundamental operations on whole number. 3.Fractional number and four fundamental operations on them. 4.Factors and multiple including their properties. 5.LCM and HCF of numbers. 6.Decimals and fundamental operations on them. 7.Conversion of fractions to decimals and vice-versa. The language/medium of the examination for the candidate will be the medium through which the candidate is studying in Class-V.The selection test will be of two-hour duration and will have 3 sections with only objective type questions. There are 100 questions in all. The total marks for the test is 100 and each question carries one mark. No change in the answer once written is allowed. Overwriting, cutting and erasing on the Answer Sheet is also not allowed. One mark will be given for every correct answer. 01. Prepare a timetable of study for the test. Do so understanding your strengths and weaknesses. 02. Allocate sufficient time for preparation as each section of the test is important. 03. Practise sample papers of previous years. 04. Revise what you study on a regular basis. Mental Ability Section: Mental Ability section is aimed at testing mental functioning and consists of questions with figures and diagram. For this section practise questions pertaining to mental ability on a regular basis. Arithmetic section: The purpose of this section is to test your skills in maths. For mathematics as well regular practise is the key. Language Test: To do well in this section all you need to do is read books/newspapers and also solve english comprehension passages.